It was a time when the simplest foods contained traps, threats, and frauds…cheese was made of plastic, butter from tallow candles; in fruit and vegetables the arsenic of insecticides was concentrated in percentages higher than the vitamin content; to fatten chickens they stuffed them with synthetic pills that could transform the man who ate a drumstick into a chicken himself….From the tins of oil it was no longer the golden juice of the olive that flowed, but the fat of old mules, cleverly disguised. So begins the thirteenth chapter of Italo Clavino’s fable-like story of Marcovaldo, the Chaplenesque hero of the short collection Marcovaldo: or The Seasons in the City (1963). I had been reading Italian literature in preparation for a spring 2013 study abroad assignment teaching environmental humanities in Siena, Italy. I loved Marcovaldo and his nostalgia for the days when his wife’s shopping bag brought him joy, for the days when he could find a forest instead of a collection of billboards from which to harvest firewood, when he could fish rivers untainted by blue paint from a nearby factory. Gentle Marcovaldo, who liberates a rabbit destined for science, harvests poisonous mushrooms from a city median, and wistfully pushes a cart down glittering aisles of a supermarket bursting with food he cannot afford. Calvino wrote the Marcovaldo stories during the consumer boom that was the Italian post-war “economic miracle”; the integrity of food and food systems is a dominant theme of the collection. I taught several Marcovaldo stories during that spring in Italy as part of my “Literature and Landscape” class. In order to make full sense of Marcovaldo’s experience, however, I knew I had to return to Italy to focus exclusively on food. My colleagues at Northern Arizona University taught food studies courses, but they were anthropologists, or political theorists, or environmental scientists. I was a literary critic. How could a humanist contribute to food studies? How could food be a marker for the sustainable humanities? I took as my starting point Roland Barthes’ assertion that beyond a primary need, food is “a system of communication, a body of images, a protocol of usages, situations, and behavior” (21). 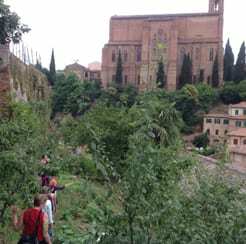 During the summer of 2014, I returned to Siena with a group of Northern Arizona Students to learn about what Tuscan food systems had to communicate. Our education began with a pig. The pig was in a fresco, probably the first secular fresco in all of Europe. Siena’s secular center is the Palazzo Publicco, where since the late 13th century the Council of Nine sat in judgment, made laws, and debated ways to defeat their mortal enemy, Florence. To remind the council to be just, they gathered in the presence of Ambrosio Lorenzetti’s 1328 fresco, The Allegory of Good and Bad Government. Lorenzetti painted three full walls of the Sala del Pace, The Room of Peace. One wall personified what the council would need to make good government–Justice, Wisdom, Harmony, and Peace, among others. Another wall warned of the effects of bad government: murderous bands roam Siena, and the medieval Tuscan countryside is burned and bleak. On the third wall, Lorenzetti painted the ideal of good government. Here, inside the city walls students sit in lesson, artisans work in store fronts, and muses dance in the streets. The countryside is prosperous and productive. The rolling Tuscan hills are dotted with fruitful fields, busy laborers, and distant neighboring cities. Traders laden with sacks of grain, peasants driving donkeys, and richly-robed citizens on horseback enter and exit the walled city. What caught my eye among the detailed figures was a lone man driving a black-and-white pig into the city. This pig, I learned, was the cinta senese, the “belted” Sienese pig, prized by famers for its heartiness, adaptability, and sweet, firm flesh. The pig had a long, elegant snout, a compact, low-slung, but muscular body, and boarish bristles about its neck and back. I’d never seen a pig like this. It plodded steadily forward along the road into the city walls; its driver’s eyes were keenly fixed on it, as if willing it to make eye contact. Over the ensuing weeks, the students and I surveyed the social and symbolic meanings of food in Italian culture and its relationship to larger issues of environmental sustainability. We learned about Etruscan civilization and their food ways, analyzing frescoes of their symposia, where men and women sat together at table. We read about the Roman Republic’s bread subsidies and later Roman Empire food extravaganzas. We walked parts of the pilgrimage route connecting Paris to Rome, along which peasants foraged for roots and greens during the decline of the “dark ages.” We visited medieval convents in which nuns during the early Middle Ages kept accounts of the reinvigorated spice trade and developed recipes for the region’s famous panforte. We studied the history of the medieval wars between Siena and Florence and learned about the ways territory and conquest were tied to the production and distribution of Chianti wine. We examined the Medici’s collection of unusual fruit and seed specimens, captured in lush paintings by some of the Renaissance’s most prolific and well-funded artists. We toured Siena’s Fisiocritici Museum, dedicated in 1691 to scientific learning and housing thousands of ecological specimens. We visited the Mezzadria Museum to see images of the long history of sharecropping in Tuscany. We sat with the proprietor at the Bottega di Stigliano, a market restaurant housed in a 200-year-old farmhouse that brought together small local producers, sold local products, and hosted EU-grant funded workshops to teach the neighbors how to make bread, grow greens, and forage for wild foods. Tuscans needed to relearn these skills, the proprietor explained, after being removed from their small garden plots and into suburbs by the post-war economic boom. We visited the mercatale to talk with vendors and artisanal producers about the philosophy of the filiera corta, the short chain that links the producer to the consumer. Students reported on the devastating effects of Mussolini’s land reforms, the deep poverty and famine between the world wars, and the miracle of economic growth after World War II that contributed to environmental pollution, habitat and heritage loss, and the disruption of food systems. We read poems, nonfiction, and fiction—including some Marcovaldo stories—that helped us understand what food communicates. It became potently clear that stereotypical images of Italian abbondanza belied the slow violence that threatened the sustainability of the food system on the Italian peninsula. Nearly every day I would walk past the Museo Civico where Lorenzetti’s allegory silently admonished centuries of civic leaders. I would think about that pig, with its long snout, black belt, and low heavy body. I fancied I understood the man driving the pig to market and his (to me) obvious desire to make eye contact with that pig. Maybe it exasperated him, rooting around his garden. Maybe he loved it, talking affectionately to it when it came in from foraging. He had raised it, lived with it for years, and now he would trade it to butchers who would transform it into lardo, prosciutto, and capicola. Our last field trip of the semester took us to Spannocchia, an organic agricultural estate just outside Siena. An Italian friend to whom I’d confessed my pig obsession urged me to schedule the “pig tour” there, and after a short hike through oak-studded hills, we arrived at the medieval farmhouse. There we were greeted by Jessica, an American intern with an advanced degree in culinary history. She led us through a muddy meadow behind the farm’s stone buildings where a group of sleepy black-and-pink piglets dozed in the sun. A 200-pound sow lay on her side as piglets suckled her. 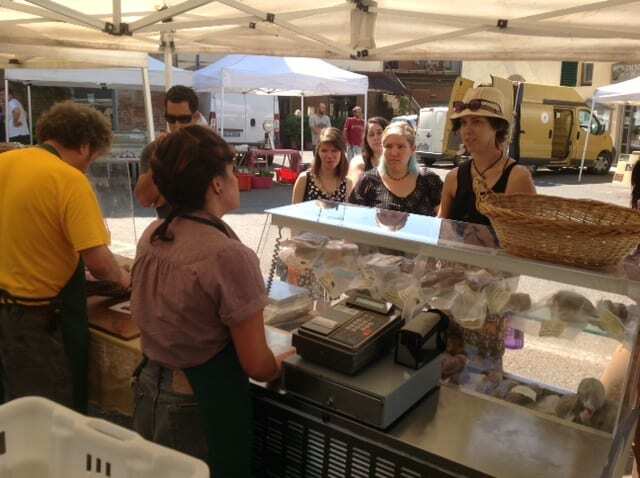 The proprietors of Spannocchia had helped bring this breed of pig back from the brink of extinction, Jessica explained. They allowed the pigs to forage for wild chestnuts and live long, semi-feral lives free from confinement and antibiotics. They had worked to obtain DOP (denominazione di origine controllata, controlled destination of origin) classification for the pork products. This quality-assurance label guaranteed that food is produced within a specified region under certain conditions; for this breed of pig, it reestablished the centuries-old relationship between the pig and its native region, protecting both pig and habitat. “How did the owners of this estate know about this pig if it was nearly extinct?” a student asked. After our tour, during which we learned about restoration efforts, visited the humane “transformation” facilities, and tasted the specialty salumi, I gathered the students for a final lecture. 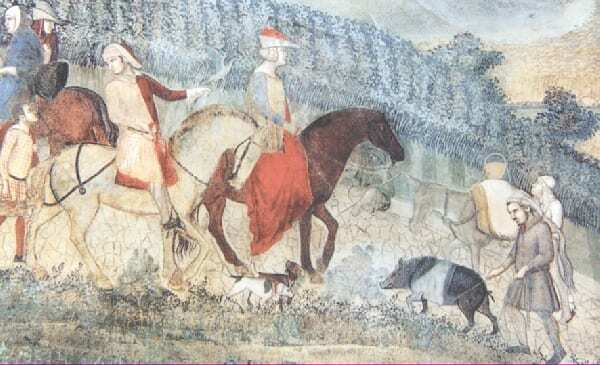 It struck me that Lorenzetti’s fresco had provided the necessary environmental memory enabling a twenty-first century community to remember a thirteenth-century pig. Lorenzetti’s image provided a counter balance to the “official” narrative of mass-produced pork, shrinking habitat, and inevitable fast food. That image helped Spannocchia and its partners establish the cinta senese’s history in Tuscany, its relationship to geography, politics, and economics. In other words, Lorenzetti’s image provided the environmental memory that helped these modern Tuscans imagine and understand a world they no longer inhabited. This was the sustainable humanities in action, I explained. That pig made us happy. That pig helped me understand how a humanist scholar could contribute to food studies. I imagine that if Marcovaldo could meet that pig, he’d be happy, too.